10 stations ready, 390 more to come. 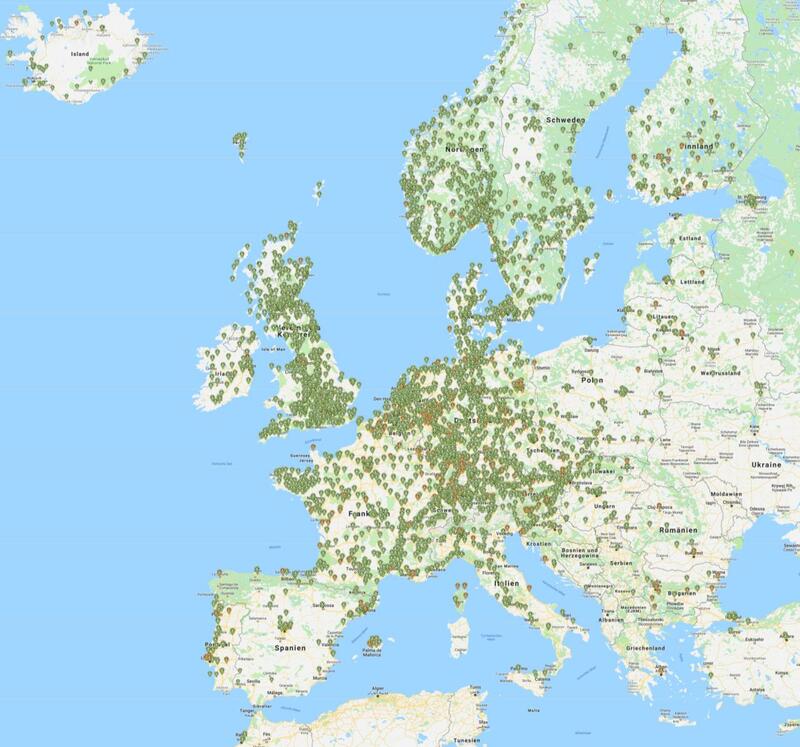 IONITY in Europe proceeds with installations of ultra-fast charging network in a similar time/pace as Electrify America in the U.S. IONITY just completed its 10th station, while Electrify America had 10 in August. The IONITY is a joint venture of BMW Group, Daimler AG, Ford Motor Company, and Volkswagen Group with Audi and Porsche. Also, the plans are similar. IONITY aims for 400 stations along major highways by 2020. Another 16 are under construction. Stations will have on average 6 stalls and power output of up to 350 kW. However, in the case of IONITY, there is no CHAdeMO, only CCS Combo 2. Here is the map – black marks are completed stations (there are some double stations – in both directions of the highway, which we believe explains why there are only seven black marks). IONITY charging isn’t free of charge. The cost of charging is typically eight… simply eight, whatever your currency is, €8, or £8, or 8CHF per session. “To demonstrate just how serious we are about the freedom to drive, for the rest of 2018 all you need to know is the number 8. Whether it’s in Euro, Swiss Francs, or British Pounds, each and every EV charge will be priced at a transparent set-rate of €8, or £8, or 8CHF per session. In Scandinavia the session fee will be 80 NOK / SEK / DKK. Easy and transparent – so you can get on the road today. 16 Comments on "IONITY Launches First 10 Ultra-Fast Charging Stations"
No matter how many kWh you charge in one session? No matter how long your charge session is? It’s more born out of need. Most provides don’t have a technical solution yet to charge by kWh that is aligned with regulatory requirements in Germany or other EU states. Most likely it will change. Maybe, but billing by the minute is a simple easy to understand way that can work very good as well. I’ve said it many times on here by now, but in Norway the majority of the DCFC network providers have settled on billing per minute. One really positive aspect of this that both the network operators and the EV drivers like is that this incentivized leaving and moving on as soon as possible. They had to introduce some charge. After installation they were free to use so people were taking the mick. Now they introduced a session fee and 8 sounds like a reasonable deterrent to stop people fooling around with them and blocking them for cars that actually need a charge. Charging 8 of your currency for a session when paying with a credit card also fulfils the EU directive that demands that a common payment method needs to be available and that pricing needs to be transparent to the user. In reality most people will have some sort of charging provider card like Maingau, Plugsurf, ChargeNow or the Audi/Porsche approach which manages the charge payment for you. In which case the rate will be according to the contract you have with those service providers. To provide some perspective on charger density in Europe for North Americans this overlay may be of use. You therefore are basically standing on a CCS charger all the time. What is this overlay supposed to be? The US roughly covers the EU all the way to the Balkan by size. I agree however with your point on charger density. Tesla for example has an OK density in Germany, but there are more than 6 fold more CCS locations alone. 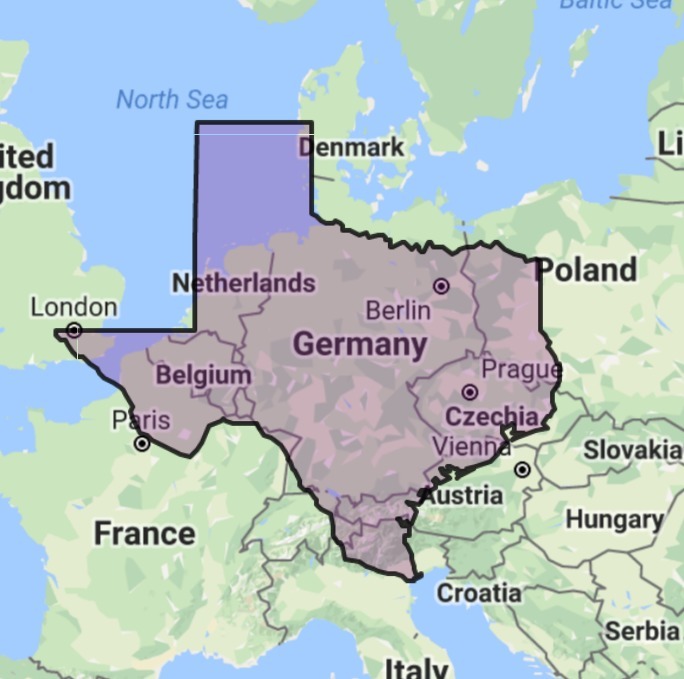 That is not the US, that is just Texas. No chademo… how sad. Hopefully the asian manufacturers will adapt their EU vehicles. EU vehicles delivered from ASIA and the U.K. (Leaf), should switch out of CHAdeMO, before it’s too late. For DC FC, it should ideally be “one continent – one standard”. Chevy and VW and Kia/Hyundai, should put the finishing touches on CHAdeMO, making it an also ran, here in the US, by 2025. While granted, it’s a US-only compliance car so far, It’s notable that even Honda is using CCS on the Clarity BEV. CHAdeMO is effectively dead outside Japan. Even if the next-gen CHAdeMO and the Chinese GB/T will merge, it’ll still be those 2 countries only; the next gen Nissan/Mitsubishi EVs may well be sold with CCS outside Japan. I’m rooting for governmental regulation that requires CCS in as many jurisdictions as possible on all BEVs sold going forward that have DC charging (yes, for Teslas as well). If the vendor really wants, they could have multiple sockets on the car. On the contrary it is great. Flogging a dead horse is just cruel, especially when there are people who don’t even understand that it is dead. https://www.electrive.net/2018/09/03/ionity-ruft-ab-heute-acht-euro-pro-ladevorgang-auf/ (in German, like 3 weeks old…) seems to have more details. 2. That prices are probably valid until end of this year. 3. Prices when using thiry-party charging customer cards are very different. E.g. Plugsurfing 8.80EUR/charge. Or Newmotion 0.10EUR/min (I think plus their usual 0.35(? )EUR fee for starting charging).